Photo: The bright and welcoming interior of Somtum Der. From the upcountry paddies of Khon Kaen comes Somtum Der, a stylish air-conditioned eatery that stays true to the intense flavours of Isaan in Bangkok’s Silom area. Popular among office workers at lunch and hip young things preparing for a night on the town, the restaurant is also easily accessible for travellers who don’t speak a lick of Thai. The small but inviting restaurant boasts bright wood floors and tables set up outside on a patio, inside on the ground floor and upstairs on a loft. Isaan travel photos and bamboo light fixtures hang as nods to the rustic ways of Northeast Thailand that also fit into this trendy hood. The place fills up every day around noon and after dark, with notably efficient staffers presenting English/Thai menus complete with bright photos of every dish. We’ve heard that the pla raa (fermented fish sauce) is pasteurised here, a consolation to the weaker stomachs of many Bangkokians, expats and travellers. Otherwise, don’t expect the chefs to hold back for foreign tastes. Flavours punch towards the sour, spicy and pungent tones favoured in Isaan, and ingredients like bamboo shoot and freshwater mud crab are plentiful. Portions are on the small side, but we’ve never been fans of huge portions of dishes like som tam and laab, best enjoyed with a lot of variety and plenty of sticky rice to cut the spice. The som tam suo Sakhon Nakhon woke us up with a good dose of fresh red chillies mixed into fresh rice noodles, grated green papaya, crunchy Asian eggplant slices and slightly astringent kratin seeds dashed over the top. It went well with kaay kung, a milder salad featuring tender prawns tossed with toasted rice, roasted chillies, scallions and thin curls of lemongrass. Served in bamboo baskets, the khao niao (sticky rice) is available in black or white grains. Carnivores should grab a plate of sun-dried beef, grilled pork neck or deep-fried balls of pork laab, while seafood enthusiasts could try a salad starring ark shell or a fiery soup with grilled catfish. Those who prefer veggies can choose from dishes like tum teua (long bean salad) and gaeng hed (mushroom soup with herbs), but keep in mind that even the vegetable dishes are likely to have some kind of fish sauce. Adventurous eaters might go for deep-fried frogs with garlic or pon gob, a frog meat chilli paste served with fresh vegetables. Prices range from 80 to 130 baht for most dishes, which is pricier than on the street but quite reasonable given the quality and ambiance. 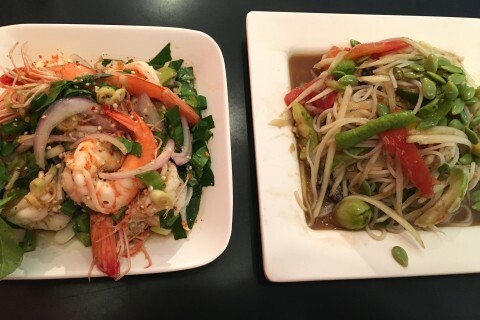 Despite a full house, both of our dishes were served within five minutes of ordering. Handmade cocktails, Chilean wines and several types of tea are listed as part of an excellent beverage selection. To find Somtum Der, take the BTS skytrain to Sala Daeng Station and descend to Silom Road via Exit 4. Pull a U-turn at the bottom of the stairs and then hang a right (south) on Soi Sala Daeng. Walk a little further and you’ll find Somtum Der on the left, marked by an English sign. Last updated on 22nd November, 2016.